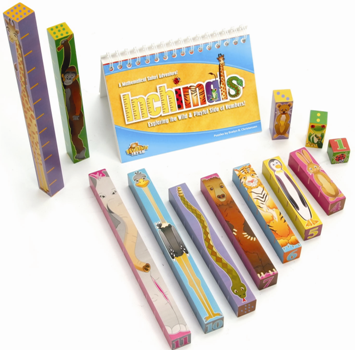 Inchimals is a set of 12 beautifully crafted wooden blocks which measure 1” in height (the tiny ladybug) to 12” high (the tall giraffe). With numerals, dot equivalents, and precise inch segments on the blocks, plus cute animals - this set is a sure way to make learning fun. Explore counting, number value and recognition, measurement, fine motor skills, estimation, language, and logic with these versatile blocks. The activities in the Inchimals write-on/wipe-off puzzle book are designed to progress in difficulty so that even young children can have success in solving simple addition problems. Equations become more challenging when subtraction, equivalent sums, and multiple numbers are introduced. View what Timberdoodle has to say about Inchimals--comments such as "the best hands-on program we have seen for teaching math to young children" and "taking the home education market by storm." --I purchased this for my 5 year old daughter who is starting Kindergarten this fall, and my 3 year old son. Both were very excited to play with the Inchimals, and both were able to quickly grasp the concept of how to use them without too much explanation. I like that each piece also has inch markings along the side, so my daughter was able to measure other toys. Very cute and well-made...I would recommend to anyone wanting to introduce their preschool children to measurement and basic math. Beth S.
Author's note: All I can say is I wish I'd had this set when my own children were young and when I was teaching kindergarten and 1st grade.